OTC scope of work : Coordination of production and supply of rock for scour protection work, assembly works on CGBS shafts. 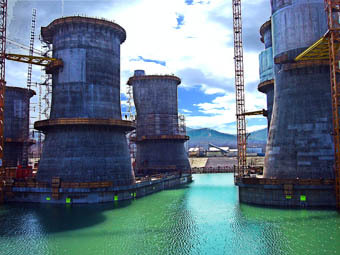 Sakhalin II is one of the most significant oil and gas world projects which introduced new technologies and new management standards to Russia. During the first phase of Sakhalin II Project, which started in 1996, «Sakhalin Energy» (SEIC) was developing Astokhskaya area of Piltun-Astokhskoe field. The second phase consisted in execution of largest project of liquefied natural gas production (LNG). It included construction and installation of one offshore platform (PA-B) in Piltunskaya area of Piltun-Astokhskoe field and one offshore platform (LUN-A) in Lunskoe gas field. PA-B – is a drilling, producing and processing platform, designed for year-round oil and oilwell gas production. It is installed in the distance of 12 km from the shore of Sakhalin Island, the sea depth is 32 m. This integrated oil and gas producing platform started production in 2007. Key facts: height from sea bottom up to the highest deck point is 121 m, which is equal to 30-storied house; living premises can accommodate 100 people for permanent stay and 40 people of temporary personnel. OTC specialists were integrated into general contractor’s team for scour protection scope and assembly works on CGBS shafts. We are proud of the fact that our personnel took part in different stages of this project execution – from construction to bringing into service.